"China has the legitimate right to conduct scientific tests within its border and these scientific tests are not targeting any country or target," PLA Sr. Col. Yang Yujun told reporters at a year-end news briefing. Yang was asked about the flight test of the DF-41 ICBM on Dec. 13 and whether the testing of the missile changed China’s strategic nuclear policy of not being the first to use nuclear weapons in a conflict. "What needs to be pointed out is that China pursues a nuclear policy of self-defense and its policy of no-first-use of nuclear weapons has not changed," he said. The reference to the no-first-use policy by the military spokesman is a tacit admission the missile involved the test of a last stage that carried multiple, independently-targetable reentry vehicles, or MIRVs. The missile test was first reported by the Washington Free Beacon Dec. 18. Defense officials said the DF-41 was launched from the Wuzhai Missile and Space Test Center, also known as Taiyuan, in central China. The missile landed in an impact zone in a remote region of western China and was closely monitored by U.S. satellite and other electronic monitoring gear. Military analysts said the test of China’s long-range nuclear missile that can carry up to 10 nuclear warheads increases the strategic threat to the United States. The Pentagon has said the DF-41 will be able to target all of the United States. China’s state-run Communist Party newspaper Global Times in November 2013 published a provocative article showing the effects of submarine-launched nuclear missile attacks against Seattle and Los Angeles that the article said would kill up to 12 million people. The article was later withdrawn from publication. However, the report revealed China’s plans for nuclear strikes on the United States in a future conflict. China’s new Jin-class ballistic missile submarines began the first sea patrols this year as predicted by senior Navy officials and the Pentagon’s annual report on the Chinese military, according to defense officials familiar with intelligence reports of the sea patrols. The nuclear missile submarine patrols also mark a major step forward in China’s large-scale nuclear forces build up that has been carried out largely in secret. The MIRVed DF-41 missile test also is expected to rekindle the debate in U.S. intelligence circles about the size of China’s nuclear arsenal, initially thought to be limited to around 240 strategic warheads. The testing of a 10-warhead missile is an indication that the Chinese warhead arsenal is far larger or will rapidly expand as new DF-41s are deployed in the coming years. A new report by the Georgetown University Asian Arms Control Project reveals that satellite photos have identified a new DF-41 launch complex at the Taiyuan launch center. The imagery is dated April 13, 2014, and is compared with a photo from 2010 of the same location. 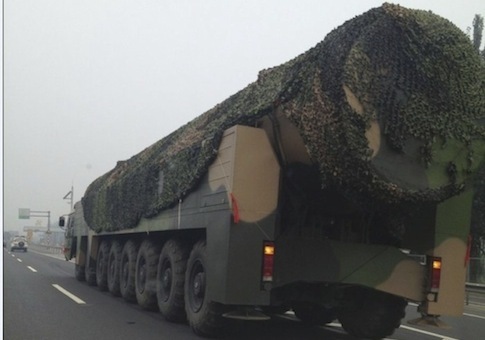 The report, dated Dec. 16, states that the DF-41 appears to be based on the Russian design SS-25 road-mobile ICBM but "with Chinese characteristics." The DF-41, deployed with either six or 10 MIRVs, as well as DF-31A MIRVed missile will increase the number of warheads in the Chinese strategic arsenal to as many as 600 warheads by 2025, according to the report. The report also reveals that China’s military is developing new tunneling technology that will permit widening construction of some of the 3,000 miles of underground strategic nuclear facilities. The new tunnels size of 17 meters wide by 10 meters wide will permit adjacent passage of road-mobile DF-31As and DF-41s as well as a possible rail-mobile ICBM variant in a single tunnel, the report said. The congressional U.S.-China Economic and Security Review Commission stated in its annual report made public earlier this month that the DF-41 will carry up to 10 warheads and initial deployment of the mobile missile is expected next year. The DF-41 will "have a maximum range as far as 7,456 miles, allowing it to target the entire continental United States," the report said. "In addition, some sources claim China has modified the DF–5 and the DF–31A to be able to carry MIRVs." The Free Beacon also disclosed in September that China is building new missile labeled the DF-31B that also is expected to be MIRVed. "China could use MIRVs to deliver nuclear warheads on major U.S. cities and military facilities as a means of overwhelming U.S. ballistic missile defenses," the commission report said. China’s MIRV technology is based on illegally exported U.S. satellite technology transferred during the administration of President Bill Clinton. Lockheed Martin was fined $13 million in 2000 as part of the illicit exports that China diverted to its MIRV warhead program. Phillip Karber, a Georgetown University professor who is associated with the Asian Arms Control project, said the DF-41 test with multiple warheads is an indication that China’s strategic nuclear arsenal could increase "quite rapidly." China inadvertently disclosed the existence of the DF-41 missile last summer when a regional Communist Party web site posted facts about the system, including that it will carry multiple warheads. The posting was removed after it was widely reported. Yang, the PLA spokesman, also declined to comment when asked if the Chinese government has been asked by the Obama administration to help provide details on the hackers behind the Sony Pictures Entertainment cyber attack and whether the hackers operated from Chinese territory. "Actually, this is not a question related to the military, and I cannot provide an answer to you here," he said. The Justice Department on May 1 indicted five Chinese military hackers who were charged with cyber attacks against U.S. companies.